There’s a reason that students who study abroad can’t stop talking about it. Spending time abroad not only fulfills academic goals, but also lets you experience a new culture, language, and environment. While the overall numbers of U.S. college students who study abroad is still relatively small, it has steadily increased over the last few years. According to the most recent data by the Institute of International Education (IIE)*, the 2013-14 academic year reached a record high with over 300 thousand U.S. students studying abroad. In fact, the amount of students that packed their bags that year more than doubled than the previous decade. So, who exactly is studying abroad, and what are the most popular destinations? Based on a table prepared by the National Center for Education Statistics on the IIE’s Open Doors: Report on International Educational Exchange, we’ve compiled the following infographics to help clarify. 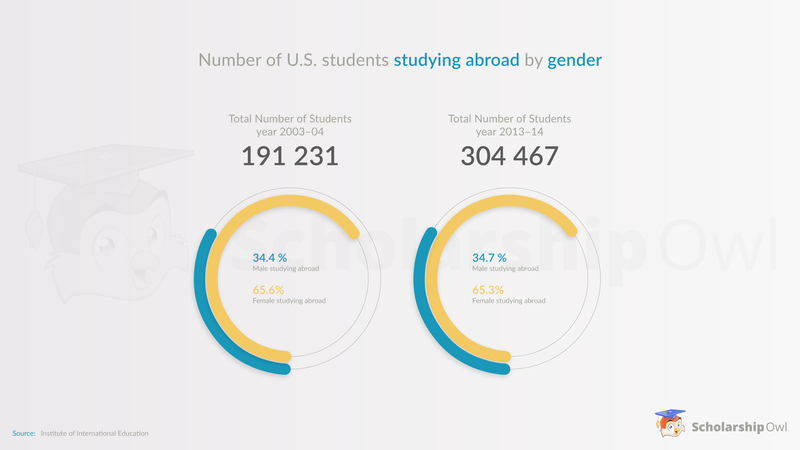 Approximately two-thirds of students studying abroad are female. This number hardly changed in 2013-14 school year in comparison to the 2003-04 school year. Nearly 84% of students studying abroad in 2003-04 were white. This number decreased by 9.4% in 2013-14. Moreover, the black and Hispanic students studying abroad increased by 2.2% and 3.3%, respectively. The smallest group of students who study abroad are American Indian or Alaskan Natives. Junior year is by far the most popular time to travel abroad followed by Senior year. However, the biggest change occurs with Bachelor’s level students, which saw a 7.2% decrease in the number of students studying abroad, dropping from third most popular in 2003-04 to fifth most popular in 2013-14. Not surprisingly, Europe is the most popular destination with over half of the students studying abroad. Growth in study abroad in Asia had the largest increase now making up 12% of U.S. students overall. A decade ago, it was most popular to study abroad for one semester or the summer term. Today, there has been a slight decrease in studying for one semester and it became increasingly popular to study abroad for 8 weeks or less during the academic year.